The Lenoir County Fair Association recently donated $500 to the Greene Middle School Teacher Assistance Disaster Relief Fund. 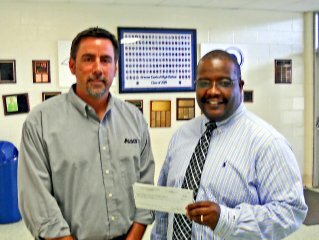 Principal Greg Monroe, right, accepts a check from Waylon Adams, president of the Lenoir County Fair Association. The association is actively working to support the community through donations like this one. 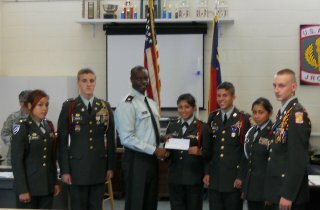 Jamie Gonzalez, Josh Parson, Jennifer Peralta, Elias Murrillo, Maxine Peralta & Cody Raynor with the Lenoir County Jr. Fair Association recently donated $500 to their East Duplin JROTC unit. Major Gary Hill accepts the check from the Jr. Fair Association. The IRONCLAD MOTORSPORTS Facility @ the Lenoir County Fairgrounds….. Check out ironcladmotorsports.com for further info. Are you ready for the… Ironclad? The tracks have new sections to kick off this year’s series of races. A new jump and two new turns, as well as some minor modifications and improvements to other sections, are waiting for you at the Ironclad! This year will be a great year for Ironclad Motorsports. You don’t want to miss all the changes that will transpire this year!